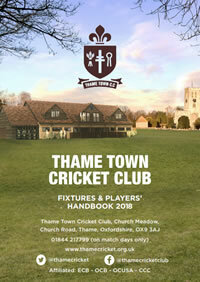 Thame Town Cricket Club will hold the 2019 AGM at the new clubhouse on Friday 8th February at 7:30pm. All are welcome to attend, with the bar set to be open. Please download the Agenda here. If any member wishes to raise a proposal, then please do so by emailing Sally Patey at sallypatey@hotmail.com by 31st January.